Tag line: "Look out! Here comes Trinity..."
Years ago, while I was on vacation, I picked up a bargain-basement DVD copy of 1970’s They Call Me Trinity at a discount book store, and was blown away by how entertaining the movie was. A Spaghetti western with a decidedly comedic tone, They Call Me Trinity owes much of its charm to leading man Terence Hill, who lights up the screen as the film’s title character. Known as the “Right Hand of the Devil” due to his skills with a gun, Trinity (Hill) pays a visit to his brother, Bambino (Bud Spencer), the “Left hand of the Devil”, an escaped criminal posing as the sheriff of a frontier town. 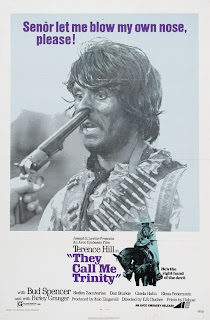 Together, they try to stop the shifty Major Harriman (Farley Granger) from driving a group of Mormon farmers off their land. The Major has assembled a small army to get the job done, but with Trinity and Bambino standing against him, odds are he's gonna need more men! The opening moments of They Call Me Trinity set the mood for the entire film. A spoof of the title sequence from 1966’s Django, where star Franco Nero drags a coffin across the screen, Trinity begins with our hero lying on a makeshift stretcher, catching a nap while his horse drags him along a dirt path. From this alone, it’s obvious that Trinity isn’t going to be your typical western gunslinger, and even though he’s handy with a pistol (after eating an entire plateful of beans, Trinity faces off against a pair of loud-mouth bounty hunters, quickly putting them in their places), his laid-back attitude results in more laughs than it does tense showdowns (his give-and-take with Bud Spencer is, at times, very funny). They Call Me Trinity was an international box-office hit, making both Terence Hill and Bud Spencer, who had already teamed up in three prior westerns (Blood River, Ace High and Boot Hill), bankable stars. After seeing this movie, I went back and watched Ace High (which co-starred Eli Wallach) and Boot Hill, as well as My Name is Nobody, a 1973 western in which Hill appeared alongside Hollywood legend Henry Fonda. On the whole, I enjoyed these films (especially My Name is Nobody), yet none matched the level of fun present in They Call Me Trinity. From start to finish, this movie is an absolute blast! Seems this is a much forgotten film today. Have you seen Trinity is Still My Name? Also, very funny.